The Aerospace Walk of Honor program paid tribute to distinguished Edwards Air Force Base test pilots whose history of achievement in the field was outstanding. Sidewalk monuments along The BLVD continue to honor the history of these brave men and women. The first in the United States honoring test pilots, Lancaster&apos;s Aerospace Walk of Honor program acknowledged the City&apos;s sixty-year tradition as the nation&apos;s aerospace center and host City to a distinguished group of internationally known experimental test pilots. Established in 1990 by the Lancaster City Council, the Aerospace Walk of Honor awarded recognition for test pilots whose aviation careers were marked by significant achievements beyond one specific accomplishment. In a profession where extraordinary achievement is the norm, honorees selected for the Aerospace Walk of Honor were those who soared above the rest. On the Walk of Honor you can see monuments for test pilots like Neil Armstrong, Charles Yeager, Glen Edwards and William "Pete" Knight, and murals of test pilots James H. Doolittle, Charles Yeager and William "Pete" Knight. The program was later concluded in August of 2009. 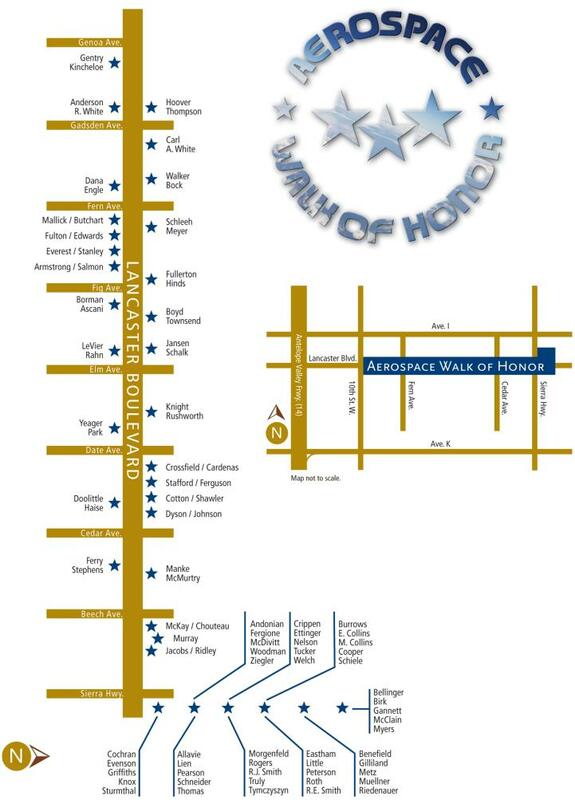 The Walk of Honor is located on Lancaster BLVD between Sierra Highway and 10th Street West. Below is a map showing all the locations of honorees, or you can download and print your own copy by clicking here.